Denpasar - Rector of Udayana University attended the Declaration of Peace Agreement of Candidate Pair of Governor and Vice Governor of Bali who will follow electoral process of 2018, Tuesday (13/2/2018). The peaceful declaration was held in front of Bajra Sandhi Renon Monument, Denpasar, organized by Bali Regional Police and attended by Bali Governor, Head of Bali Provincial DPRD, Pangdam IX Udayana, Kajati Bali, Head of District Court, Head of KPU, Head of Bawaslu, Both Candidate Pair and Team Success, Religious Figure, Rector of Udayana University, and other Youth Leaders. Bali Police Chief, Inspector General Pol. Petrus R. Golose conveyed in this event specifically invited the Rector of Unud as a representative of the academic elements to participate in maintaining Bali's keajegan. This declaration is a commitment of the nation's children in maintaining security and peace in Bali, which refers to the philosophy of the community of Bali Tri Hita Karana as a foundation in maintaining peace. Pilkada 2018 is expected to produce a leader who can advance Bali, and hopefully through this declaration the losing couple must be sincere for the sake of Bali as a barometer of world peace, considering Bali will host the implementation of IMF-World Bank Annual Meetings 2018. 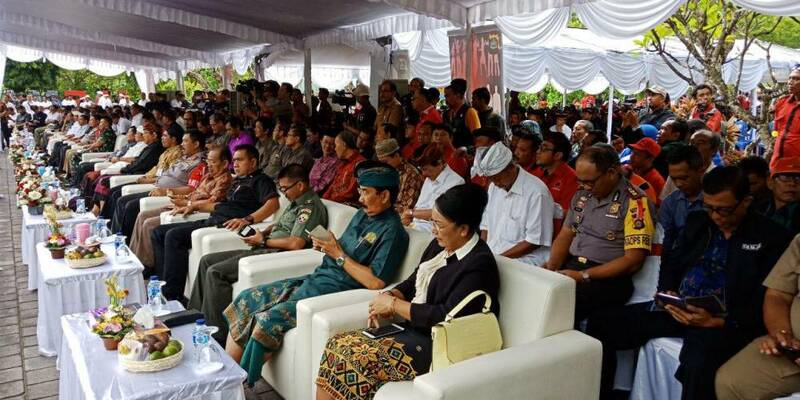 In his speech, Bali Governor Made Mangku Pastika welcomed this activity and appreciated the Bali Police Chief who had initiated a peaceful declaration. The Governor said this activity is a commitment of all stakeholders to create an orderly, smooth, safe and peaceful Pilkada. The success of the election is a barometer of democracy and politics, especially in the province of Bali. Given the magnitude of potential conflicts in the implementation of elections, it is expected that all parties create a safe and peaceful Bali. The governor also advised "only sincere and sacred heart intentions that can make us bring Bali better, Bali Santhi, peaceful Bali". Therefore, in the implementation of Pilkada it is expected that there should be no money politics, black campaign and violence or intimidation. The Governor also urges all parties to always maintain a conducive social climate during the Pilkada implementation stage.